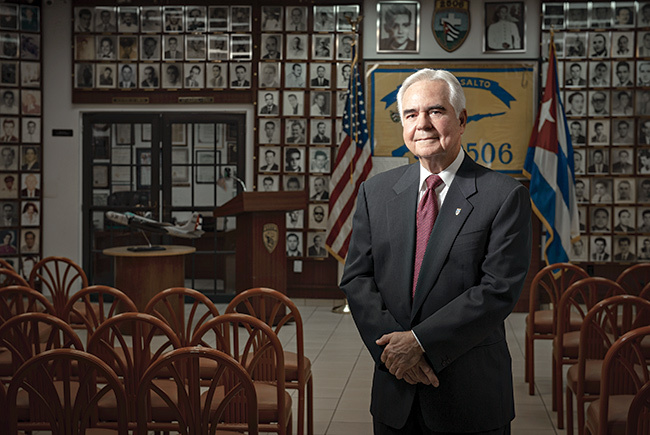 Lopez stands in the Bay of Pigs veterans museum in Little Havana. The story is still alive. This place, I think it has soul (Bay of Pigs veterans museum). No matter how many times I come in here I feel something, which is just seeing a photograph of my friends. It hits you really hard. We’re getting a lot of the tourists that are transiting Calle Ocho. A lot of people are going to Cuba, and they get that side of the story and then when they come back they come over here to hear what we have to say. Many people go there, and they go to the tourist places. ‘How beautiful.’ The beauty always has been there. What changes is there’s a government there that’s communist-oriented that has done a lot of damage to the people of Cuba, that has executed thousands and thousands of people. I became a second in command in a company. Maybe because my Boy Scout experience. I had the rank of Eagle Scout in Cuba. There were three different places where the paratroopers jumped. I jumped in San Blas. I was 20 years old. During the transportation of the prisoners to Havana, they were using trucks and buses. I went into a refrigerated van, no A/C though. Hermetically sealed. Packed like sardines. We told the officer, ‘You can’t close the doors; we’re going to get asphyxiated.’ In the middle of the afternoon in Cuba with the sun really hitting. Guys sweating, urinating. There were people standing. As they were getting dizzy, they would fall on top of the others. It was a horrible situation there. Nine people died of asphyxiation. We spent the two years in prison. There was a group of us that were still gung-ho. We wanted to go back to Cuba and fight. We thought the United States would not allow Cuba to become a communist country so close to the coast of the United States. I have a picture with President Kennedy. I guess he felt bad because of the fiasco of the invasion — he offered all the officers of the invasion to become officers in the armed forces of the United States. I became an infantry officer. Later on, I transferred to the logistics. I loved logistics. I spent 26 years. I feel very proud of being a colonel. I earned it. My family was middle class. I was supporting Castro. He promised a lot. When he had power, he changed. There was a sergeant in the police in times of Batista that was a friend of the family. A good man. They announced they were going to have a trial because he had been involved in crimes against the people. A couple of people came accusing him of crimes, people that were not from our town. This guy is not the guy they are painting him. The trial didn’t last long — 15, 20 minutes. He was executed. Right from that point I said this is wrong. I had two tours in Vietnam. If you were a commander of a unit, you had to write the circumstances the son or daughter had died. That was one of the hardest jobs for an officer to do. I never received any answers to the letters except on this occasion: This woman wrote to me. I have kept that letter with me for 50 some years now. Every time I read it, because I have it right on my desk, it makes me feel humbled. She was comforting me. HMOs. You know who came up with that? It was a Cuban. You know, I didn’t vote in the primaries for Trump. At the end we think we did the right thing when we endorsed him. Cuba was only one factor. Cuba, of course, will always be one thing we will always have in our minds but also the United States is our country. We thought the damage that Obama had done in this country was such a thing that if Hillary was going to continue with that, we could not allow that to happen. It was the only time in history the association of the veterans has really come out in support of a candidate. There was a beach by the Eden Roc. If you wanted to find all of the teenagers, Cuban teenagers, you could go there. We went to the beach with my cousin Humberto and were looking at the girls, and I saw this girl and I said, ‘wow, I’m going to have to get married to that girl.’ We have been married for 53 years now. My memories of Cuba, they’re wonderful. Of course, I’m very loyal, very grateful to the United States because they accepted me here. For me, Cuba is a dream.